Russia's Air Force and special op's units were part of the operation to liberate the iconic Syrian city of Palmyra from Islamic State terrorists earlier this week, Col. Gen. Andrey Kartapolov, commander of the Russian forces in Syria, has said. “I’d like to highlight the actions of our Aerospace Forces, which deprived the enemy of the ability to maneuver and timely deliver reinforcements, [as well as] the actions of the subdivisions of the Special Forces of the Russian military, which conducted reconnaissance and hit the most important objects,” Kartapolov told reporters on Sunday. “We spent a lot of time preparing it, taking into account all the special factors that were revealed during the previous retaking of Palmyra, which allowed us to carry out the task within a short time and with minimal losses,” he explained. — Lizzie Phelan (@LizziePhelan) 5 марта 2017 г.
Kartapolov also praised the bravery and self-sacrifice of Syrian soldiers, officers, and militiamen. “I think the most important thing is that the Syrian soldiers and officers believed in themselves, they believed that they can return what they had lost," he said. 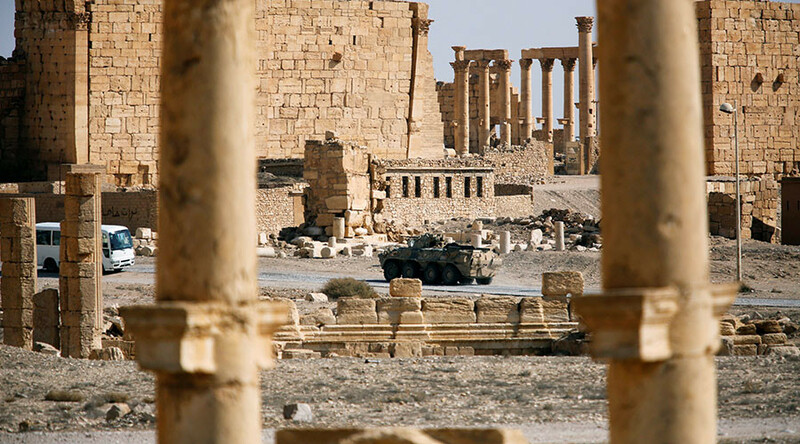 Earlier, the head of the Russian General Staff Main Operational Directorate, Sergey Rudskoy, also pointed to the “decisive contribution” made by Russian forces to the victory in Palmyra. Rudskoy particularly praised Russia’s Ka-52 helicopters, which demonstrated their high efficiency in mountainous areas and desert terrain. Syrian army Brigadier General, Fuwaz Mustafa, told reporters that victory in Palmyra would’ve been impossible without Russian involvement. The Syrian general expressed confidence that the iconic city will be quickly rebuilt. “Palmyra is our history and our heritage. With the help of our friends well restore it. Everything is going to be like before the conflict here and we’ll show that we live for peace and humanity,” he stressed. On Sunday, music once again filled the famed Palmyra theater as SUB musicians performed amongst the ruins. "A little destruction won't stop us from coming here to play and sing on this stage, despite what happened to it," teenage musician Angel Dayoub playing there told AFP. "I want to play music and sing everywhere that has seen the expulsion of IS, which hates singing and banned playing instruments," she said. "Everyone will rebuild in their own way. We want to rebuild it with music and singing." Palmyra, a UNESCO World Heritage Site, used to be one of the most important centers of the Roman Empire. It fell under IS control in 2015, with the terrorists blowing up historic monuments. The city was liberated in last March after a two-week operation by the Syrian Army, with the backing of Russian aviation. In May, a Russian symphony orchestra titled “Praying for Palmyra - Music revives ancient ruins” led by maestro Valery Gergiev, delivered a poignant performance on the site of the ancient ruins. However, Palmyra was retaken by IS in a counter-offensive in December 2016, which forced the Syrian Army to retreat, evacuating 80 percent of the population. The jihadists resumed their assault on the historic heritage site, destroying Palmyra’s Roman Theater and the legendary Tetrapylon. The new operation to liberate the city was launched shortly afterward, with government forces, in tandem with Russian planes and helicopters, successfully driving IS (IS, formerly ISIS/ISIL) terrorists out of the renowned city.